The faint sounds of jingle bells can now be heard as Christmas emerges from around the corner- bring on the joy, bring on the turkey, bring on the presents, and bring on some of the best DVDS for 2009, courtesy of 4DVD! LISTED: The Best of Never Mind the Buzzcocks ,Rhod Gilbert and the Award-Winning Mince Pie, Russell Brand Scandalous - Live at the O2 , Jimmy Carr Telling Jokes , Krod Mandoon And The Flaming Sword Of Fire, Shameless Christmas and New Year Special, Peter Kay's Britain's Got the Pop Factor and Possibly a New Celebrity Jesus Christ Soapstar Superstar Strictly on Ice, Peep Show Series 6 and 1-6 Boxset, and Supernatural The Complete Fourth Season. Watch the clips that were too rude, too drunk, too nasty, too sweary and too awkward for TV on The Best of Never Mind The Buzzcocks DVD - a must for all fans. Never Mind The Buzzcocks, the legendary satirical music series known for its dry sarcastic humour and caustic wit, is available to own for the first time on DVD on Monday 16th November courtesy of 4DVD. The hugely popular show first hit our TV screens in 1996 and became an instant hit with comedy fans. It's been running for 13 successful years and 22 series later it's still going strong. With the show's reputation for the unpredictable, celebrity guests are primed for the occasional embarrassment and harmless ribbing, as their knowledge of music is put to the test. The multi-award-winning Welsh wonder and star of the Royal Variety Performance, Rhod Gilbert, is back with his hilarious and critically acclaimed show 'Rhod Gilbert and the Award-Winning Mince Pie', available to own on DVD from 16th November 2009 courtesy of 4DVD. Since his Perrier Newcomer-nominated debut show - 'Rhod Gilbert's 1984', Rhod has been haunted by critics describing him as a 'serial fantasist of ex-prime ministerial proportions'. So Rhod decided to abandon his fictional tales of Llanbobl, and try living in the real world for once in 'Rhod Gilbert and the Award-Winning Mince Pie', for which he received a nomination for the highly coveted if.comedy 'best comedy show' award in Edinburgh 2008. Russell Brand, the most thrilling comedian of his generation, will release his third DVD, Scandalous - Live at the 02, through 4DVD on Monday 9th November 2009. His first live DVD in two years will feature fresh stand up material inspired by the Sachsgate scandal, including Brand's first hand experience of the media storm that followed his actions with Jonathan Ross on the BBC Radio 2 show. 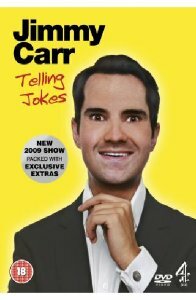 Britain's most acerbic and satirical comedian, Jimmy Carr, marks 10 successful years in comedy with the release of his fifth live stand-up DVD, Jimmy Carr Telling Jokes, available to own through 4DVD on Monday 2nd November. Featuring 90 minutes of fresh material that's just too rude for television, the new title will see Jimmy Carr at his best; creasing up the nation with relentless one liners and putting down brave hecklers with equal panache. Forget about a traditional Christmas of tinsel, turkey and sprouts, as the Gallagher's celebrate this festive time of year Chatsworth style. Shameless Christmas and New Year Special isavailable on DVD on Monday 26th October courtesy of 4DVD. It's Christmas on the Chatsworth Estate and this feature length episode kicks off with the miraculous appearance of a lorry-load of lifted meat, swiped by Kev (Dean Lennox Kelly) and Lip (Jody Latham). Although the Christmas miracle turns out to be a turkey when the army is called in and the estate is sealed off. Available on DVD for the first time, Krod Mandoon And The Flaming Sword Of Fire is a groundbreaking five part fantasy action comedy epic starring the super-buff Sean Maguire and the fiendishly funny BAFTA award-winning Matt Lucas. Krod Mandoon And The Flaming Sword Of Fire as seen on BBC2 is available on DVD from 23rd November,courtesyof 4DVD. In the darkest days of the Meconian Empire, tyranny reigned throughout the land until a glimmer of hope arrived - the son of a blacksmith and a stay-at-home mum, a man of unwavering determination: Krod Mandoon (Sean Maguire, Meet The Spartans), the last great hope in the struggle against the evil ruler, Chancellor Dongalor (Matt Lucas, Little Britain). Comedy genius Peter Kay is back with his hilarious reality TV parody Peter Kay's Britain's Got the Pop Factor and Possibly a New Celebrity Jesus Christ Soapstar Superstar Strictly on Ice, available to own on DVD on Monday 28th September courtesy of 4DVD. This was Peter Kay's first original show for over four years, and pulled in a massive 7.1 million viewers - making it one of Channel 4's highest rated shows of all time. Winner of 'Best Comedy Performance' at the RTS Awards - describing it as "brilliantly visually realised, and a perfect parody of the genre"; the series also received 'Best British Comedy Television Programme' award from BAFTA/LA and the 'Best Music / Variety Program' at the Banff World Television awards.